Addis Ababa city tours which most tourists experience them include the most important attractions and must-see points of interest in the city. Addis Ababa is in the center of Ethiopia, and the perfect place to get started in for the ideal first impression of Ethiopia. It is full of sights and you need more time than what you expect to visit just part of it. Paragon Ethiopia Tours offers an extensive selection of Addis Ababa sightseeing tours. These sightseeing, points of interest are places where one can see contrasts and great ethnic diversity and also where multiculturalism is easy to see. Addis Ababa is the capital of a dream destination for many travelers. And beyond its striking facades, Addis Ababa is an accessible city with a story to tell and plenty to experience. Addis Ababa is full of colorful and dramatic history. Her African charm unites with the Ethiopian way of life. This city features many opportunities for exploration including museums, zoos, monuments and statues, palaces, and more. Addis Ababa tourist attractions can be explored by private vehicles as they are a bit far apart. The engine room of Addis Ababa are Arat Kilo and Sidist Kilo areas where the most important museums of the country, the Ethnographic Museum of Addis Ababa and the National Museum of Ethiopia are located at. Addis Ababa is the palace of Africa founded by Emperor Menelik II in 1886 when many visionary ideas were born, and transformed from a small village into a fine metropolis. The last 1900s was boom time for Addis Ababa. It is a new flower that has remained undimmed and which now attracts 1 million visitors a year making Addis Ababa the sixth most visited city in Africa. Addis Ababa offers endless possibilities to spend the evening. The Old Airport area of Addis Ababa is just one of the places full of visitors in a city with 24 hours of entertainment. From Addis Ababa Bole International Airport, it is not far to the famous Addis Ababa Golf Club where you will have an opportunity to enjoy a breathtaking view of the golf course which invite you to relax. You can also play a golf if you are a golf enthusiast. It's no secret no secret that the residents of Addis Ababa like to have a good time. As the sun sets, the city comes alive with groups of friends heading out for dinners and cocktails, or for a fun-filled night of dancing at one of the city's many nightclubs. Weekends are specially bustling, but don't discount the week nights---as long as there's something going on, people will be there. We hand you first pamphlets for city tours if you have not booked your city tour yet. We can customize our Addis Ababa city tours for you in such a way that they can fit for your airport layover tours or airport stopover tours. Enjoy our half-day Addis Ababa city tours in which you will have a chance to stop at more than 12 places around the city with our luxury minivans which we provide our clients a truly memorable experience in Addis Ababa. Please do not hesitate to contact us even you have only limited time while you are in Addis Ababa be it for a business trip or to accomplish any other task. We can customize your itinerary in such a way that you can visit the most important sightseeing spots in half-day time. Experience Addis Ababa city in our full-day city sightseeing on these action packed tours that include the most important attractions of the city like the museums, local markets, monuments and statues, and more. In this tour, you can see Addis Ababa City Hall, the largest city hall in Ethiopia. It is also one of the largest municipal buildings in Africa. You have many things to see in the neighborhood all around this city hall. Other interesting attractions nearby include the Addis Ababa St. George Cathedral and Menelik II Square. A full-day's visit has really been a gratifying and spectacular day. Shopping in Addis Ababa presents a selection of different goods to buy. These goods include baskets, jewelries, traditional clothes, magnets, Ethiopian artifacts, books, handicrafts, and more. The city has lots of souvenir shops, something like an antiques shop. It really makes fascinating element your visit where you can buy some of these crafted items you only find out here. Morning Star Mall, Dembel City Center, and Addis Mercato are some of the most beautiful shopping malls in Addis Ababa. With more than 27 international restaurants serving a variety of Chinese, Indian, and Italian delicacies, along Ethiopian gastronomy there is something to suit every taste here. From freshly prepared hot and cold dishes to traditional Ethiopian dishes, there is something to cater for all tastes in Addis Ababa. Addis Ababa's multi-ethnic population means visitors are assured of a wide variety of Ethiopian and international cuisine. Addis Ababa has literally hundreds of of dining outlets. 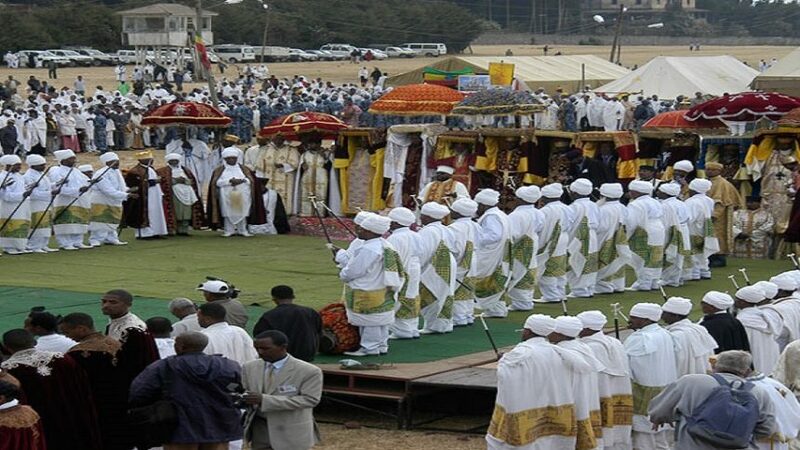 Some of Ethiopia's religious festivals and events are warmly celebrated in Addis Ababa. This city also offers a variety of open-air events. Be it festivals like "Timkat", "Ethiopian Epiphany" or traditional Ethiopian folk folk festivals, year after year Addis Ababa's event highlights draw hundreds of thousands visitors to the streets and squares of the city. Most of the events are free. The National Museum of Ethiopia and the Ethnographic Museum of Addis Ababa are among the top museums in Africa and the most popular in Ethiopia. Paragon Ethiopia Tours can arrange tours offering very different experiences of these important museums. During the high season, up to 3,000 people can visit them each day. You can consider one of our private tours to avoid crowds inside the museums. They are a bit expensive, but if these museums are important part of your trip or Addis Ababa city tour, they're worth the expense. Detailed Addis Ababa City Museum Tour Itinerary: After pick up from hotel, drive to the National Museum of Ethiopia to see archaeological, historical, and artistic items. You will visit a pale-ontological exhibit of fossilized evidence of the massive saber-toothed feline Homotherium and the gargantuan savannah pig Notochoerus, Lucy, locally known as Dinknesh, is the centerpiece of it at the basement of the museum. In the ground floor, you will see historical exhibits dating from pre-Axumite era artifacts to the royal collections of Haile Selassie I up to 1974. At the first floor, you will experience Ethiopian art from the 14th century to the contemporary time period, including that of the late Maitre Artist Afewerk Tekle. The second floor will give you a chance to see a collection of traditional weapons, utensils, jewelry, musical instruments, and from ornamental vases through to magnificent gold and silverware of past Ethiopian emperors. There is a secret video dedicated to this museum. This tour is available seven days a week from 09:00 am – 05:00 pm. Not far from the National Museum of Ethiopia is the Ethnological Museum, displaying the second largest collection of Ethiopian antiquities in Ethiopia. The next drive will take you to this museum which is one of the most important points of interest in Addis Ababa. Guarded by the statue of the Lion of Judah, the Ethological Museum shares a building with the Institute of Ethiopian Studies.This museum is more of cultural museum. In this attraction, you will see the fascinating traditional life cycle of Ethiopian people which is displayed with different artifacts and handicrafts used in childhood, adulthood and death at the first floor. In the second floor, you will visit religious art of different kinds, looms, spinning machines, some examples of jewelry and adornments. There are sections displaying tools and utensils, saddles and bits, and boats and ploughs. This museum also exhibits old currency and postage stamps. This tour is available six days a week, from Monday through Saturday from 09:00 am – 05:00 pm. IMPORTANT: Religious and public holidays might affect this sightseeing spot. The Black Lion Monument, the Equestrian Statue of Emperor Minilik II, Yekatit 12 Monument, and Tiglachin Monument are the most recognizable icons of Ethiopia and the rest of African nations representing the victory of Ethiopians over the colonial powers who came to Ethiopia to invade it during the scramble for Africa. These statues are located in Addis Ababa and were dedicated at different times to commemorate those patriots who lost their lives when fighting with the invaders. Detailed Itinerary: One can visit the Lion of Judah Statue, the Black Lion Monument, the Equestrian Statue of Emperor Minilik II, Yekatit 12 Monument, Tiglachin Monument, and Tewodros Square in these city tours of Addis Ababa. Most of these major Addis Ababa tourist attractions are located at the heart of the city. These tours will give you a chance to see the city’s most popular monuments and statues in a special way. After pick up from hotel, drive to Menelik II Square to see the equestrian statue which was established to commemorate Emperor Menelik II who defeated the Italian force at the Battle of Adowa in 1896. Menelik II was the first African leader to defeat a colonial power. This sightseeing spot is available seven days a week. Then drive to the Lion of Judah Statue to see a symbol of Ethiopia’s monarchy and a real black beauty with the stylized fur of the lion made out of black cubes. It was looted in 1935 by the Italians and set up in Rome but was returned in the 1960s. Finally, you will drive to Yekatit 12 Monument which is located near the main campus of Addis Ababa University. Yekatit 12 Monument is a marble obelisk dedicated to the Ethiopians who were massacred by Italian forces after 1937 assassination attempt on Viceroy Graziani shows the horror in bronze. This attraction is available seven days a week. At Addis Ababa Botanical Garden, we have the public come and enjoy themselves and learn about plants. It is incredible to understand what our natural world gives us. You can walk through the native wildflowers and see huge trees and many other flora species. This botanical garden is the perfect place for recreation and documenting, preserving celebrating the beauty of plants and nature. Detailed Itinerary: Addis Ababa Park, Gulele Botanical Garden, and Mount Entoto are some of the best places of interest one can see in his nature tour of Addis Ababa. After breakfast, drive to Mount Entoto where Addis Ababa city was started. This place is located at an altitude of between 2,650 and 3,200 meters above sea level. It is covered with dense eucalyptus trees, and you will be filled with the smell of this tree while you are there. After you finish this sightseeing, drive to Gulele Botanical Garden. This botanical garden can be easily visited from the downtown of Addis Ababa city. One can see various species of plants whose survival is threatened here. The vegetation here is broadly categorized into dry evergreen Montane plants. It is one of the few best places in Addis Ababa for relaxation and restful enjoyment. All the attractions mentioned under this tour are available seven days a week. The Lion Park in Addis Ababa has hosted genetically unique lions which one can not find them elsewhere in the world. One can have a unique experience in this city tour. Detailed Itinerary: After breakfast, drive from your hotel to the Lion Park which is located near Yekatit 12 Martyrs Square (Sidist Kilo) in Addis Ababa to see lions and lioness in their cage. In this attraction, you will have a chance to see Ethiopian Black lions, apes, tortoises, and other fauna species. The best way to visit Addis Ababa is using our sightseeing tour buses which pass by main tourist attractions. Paragon Ethiopia Tours also provides VIP Addis Ababa private tours, all around tours, downtown tours, uptown tours, night tours, and guided walking tours of Addis Ababa city. Our night tours include dinner. please visit Addis Ababa Travel Guide to get more travel tips on Addis Ababa. Group Size: Our group size on all our Addis Ababa city tours is usually between 20 people and 30 people keeping it a nice, friendly and comfortable size. Feel free to just wonder, so you can rearrange the schedules and itinerary selected here combine them in anyway that suits your personal preference.